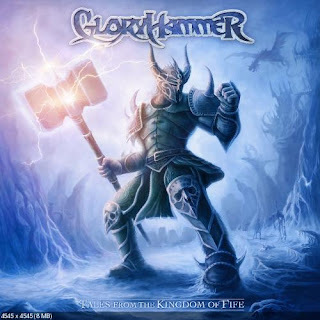 Hall of the Mountain King: Review: Gloryhammer, "Tales from the Kingdom of Fife"
Bowes has put together a solid band, to go with his soaring keyboards. Vocalist Thomas Winkler is a powerhouse that has enough character in his voice to stand out in a sea of singers in the genre that often blend together. The trio of guitarist Paul Templing, bassist James Cartwright and drummer Ben Turk are locked in, sounding like they’ve been playing together for years. Tales from the Kingdom of Fife is, naturally, a concept album about a fantasy version of medieval Scotland. The tale gets underway with a galloping story of a unicorn – yes, you read that right – a unicorn invasion of the town of Dundee. Mind you, these aren’t normal unicorns, but evil, undead unicorns. That’s followed up by the introduction of our hero, “Angus McFife,” who arises from the smoking ashes of Dundee. This is one of my favorite tunes on the record, a majestic number with an earworm chorus. I haven’t been able to get the thing out of my head since I heard it. The rest of the album tells the tale of his quest for vengeance. He, of course, has to find a magical hammer of glory, save a princess and do some other heroic things along the way. All along the journey, the guys in Gloryhammer never tip their hand to the satirical nature of what they’re doing, and the truth of the matter is that they end up making music that’s far better than most of that coming out of what has, for me at least, become a pretty stagnant genre. “Quest for the Hammer of Glory” and “Hail to Crail,” for example, are better Manowar songs than Manowar has put out in quite some time. In the synth line of “Hail to Crail,” Bowes also offers just a little bit of a nod to Alestorm with a modified version of his patented high seas sound. And, of course, what would an epic power metal record be without the, well, epic song. That would be “The Epic Rage of Furious Thunder,” a ten and a half minute opus that opens with an operatic sound that Winkler plays really over the top. It’s one of only a few places on the record where they give away the fact that they’re not completely serious. From there, we move into a bashing and soaring, double bass drum-filled power piece that pauses briefly for a whispered line from a female voice. It shifts through movements that bring back that silly operatic voice, then the obligatory symphonic interlude, here accompanied by female vocals, then the Queen-like build back up to the blazing speed part and finally an overwrought, wizardly spoken word wrap up of the story to the thunder and soft fade away. So, yeah, Bowes and his merry band are having a little piss-take with the genre, but in the process they’ve created one of the few power metal records that I’ve spent serious time with in recent years. Of course it’s cheesy. It’s power metal. Of course it’s funny. It’s Christopher Bowes. But it’s not goofy, and it’s no joke. Some “real” power metal bands could study what Gloryhammer does to learn how to create a more compelling album.